This is another one of those recipes that had me feeling tripped up over terminology. 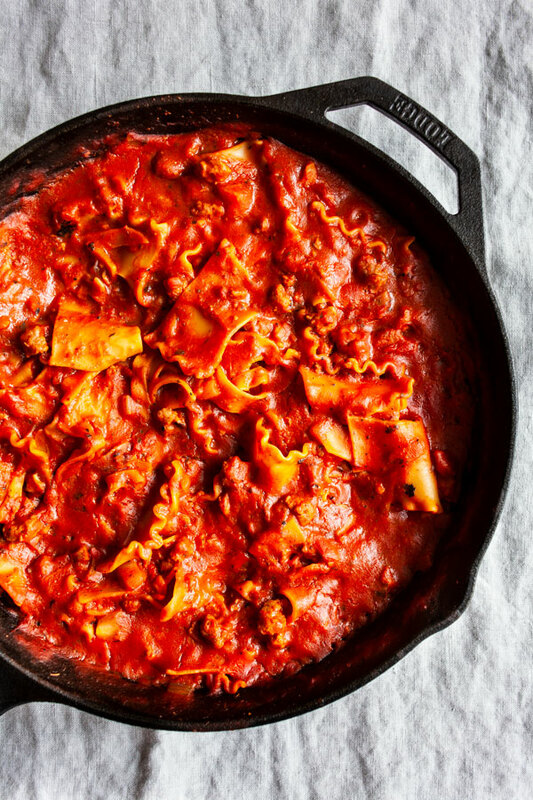 Lasagna, even a skillet lasagna, is typically made with layers of melty cheese. 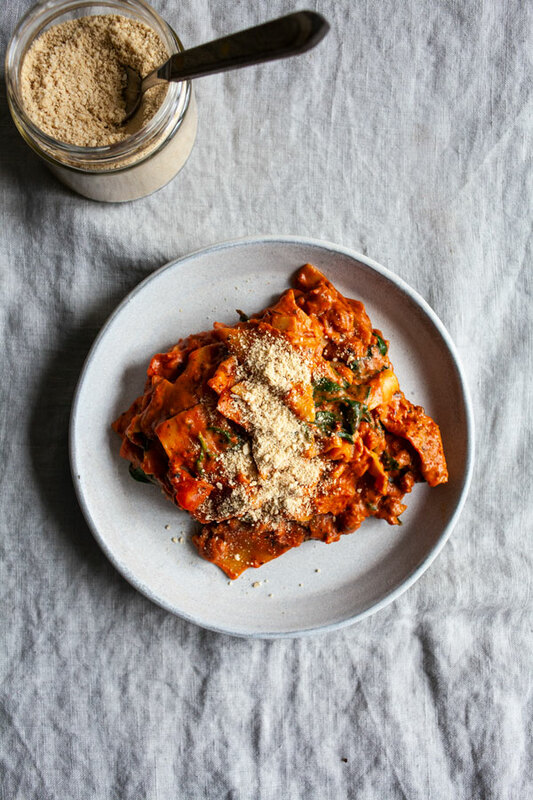 This one forgoes those layers for the addition of cashew cream, which makes the whole thing creamy/cheesy/etc., but makes it a departure from anything resembling traditional lasagna, too. So why not label it creamy skillet pasta? I guess in spite of all the deviations I took from tradition, when I was eating the dish it still registered more strongly as lasagna than regular pasta. It’s dense, full of flat layered noodles. It reads as something that might have emerged from the oven, in spite of the fact that it requires no baking time at all. 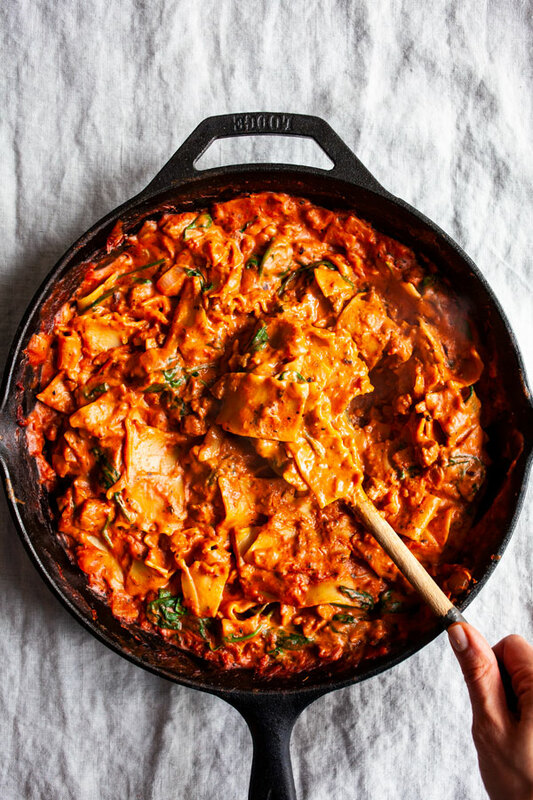 And it has the richness of a celebratory, weekend-worthy pasta centerpiece. To make the dish, you start by sautéing shallots, garlic, and—if you like—your favorite vegan meat/sausage. I used Beyond Meat beef crumbles, but any vegan beef-style crumble or crumbled sausage (Field Roast, anyone?!) would be great. If plant meats aren’t your thing, you can easily substitute cooked lentils. 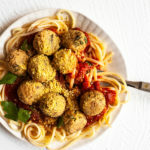 I prefer the vegan meat because it makes the dish feel like totally authentic comfort food, but both options work nicely. After the plant meat, shallots, and garlic cook down, you add diced tomatoes and tomato sauce, broken lasagna noodles, some water, some dried spices. You let the whole thing simmer, uncovered, for 15-25 minutes (depending on whether you use no boil noodles or not—I’ve now tried both). 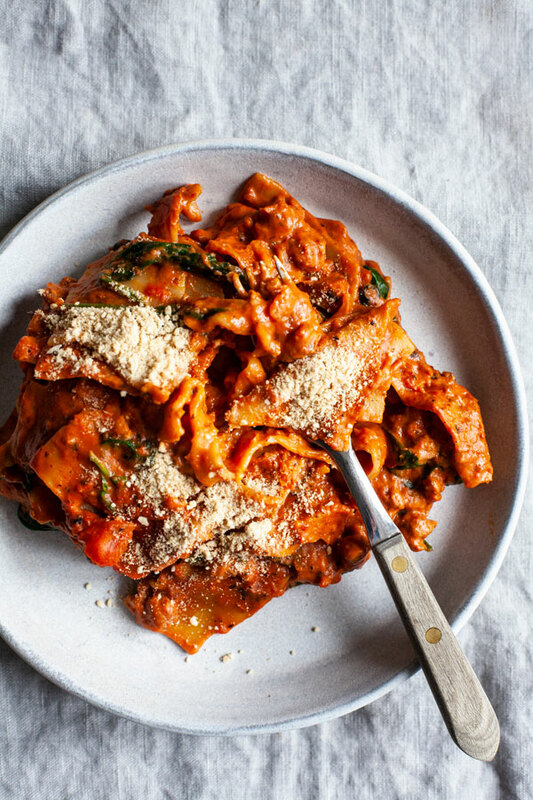 Stir in cashew cream and a few handfuls of baby spinach, if you like, and voila: a layered, decadent, delicious pasta supper. No boiling noodles separately from other components, no baking required. The recipe is like a lot of my recipes these days: relatively flexible and unstructured. Lentils vs. beef crumbles, canned tomato sauce vs. marinara from the jar (or heck, homemade), greens vs. no greens, parmesan topping or not: it’s all good. By nature I’m a fairly meticulous cook, but—just as it’s making me value stillness, this DI experience is making me value a little spontaneity and ad-libbing in the kitchen, too. With all of the new structure in my days, I’m coming to appreciate flexibility in other areas of my life more than ever. Cooking included. Heat the olive oil in a large skillet (I use this one, which is 12 inches) over a medium flame. Add the shallots and vegan beef crumbles. Continue cooking for 5-6 minutes, or until the crumbles are browning and the shallots are tender. Add the garlic. Cook for another minute or two, until the garlic is very fragrant, stirring constantly. Add the diced tomatoes, tomato sauce, oregano, and lasagna noodles to the skillet, along with 3/4 cup water. Mix well, submerging the noodles as best you can. Bring mixture to a boil. 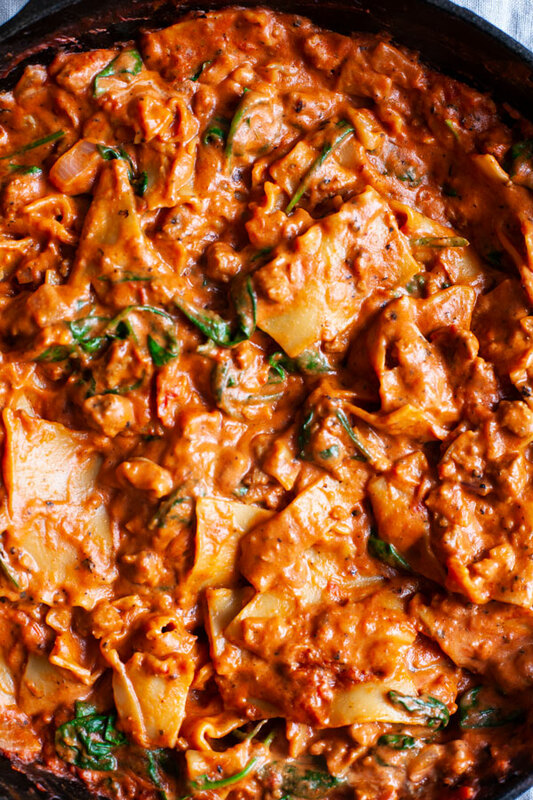 Reduce the heat to low, then simmer the skillet lasagna for 10 minutes. Stir and make sure all of the noodles are well covered. Simmer for another 5-7 minutes, or until the noodles are tender. Stir in the cashew cream and the baby spinach, if you're using. Continue cooking until the greens are tender. Taste the pasta; most sauces are salty, so it may not need any salt, but add salt and freshly ground pepper to taste. Serve, with vegan parmesan if you like. 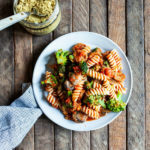 If you use regular noodles, you can par-boil them before adding (about 8 minutes) and proceed as indicated, or you can add then directly if you don't mind some extra cook time. They'll need about 20-25 minutes to simmer, and you may need to add an extra 1/3-1/2 cup water when you stir them halfway through the simmering time. Use your judgment and taste them for doneness! I made this dish on Saturday, feeling more burnt out than I wanted to feel over the weekend, when there’s always so much I’d like to do. 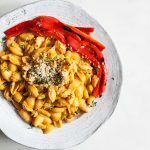 It was so special to have a true comfort food meal to dive into on Saturday night—especially since it didn’t require me to spend too much time cooking. And the leftovers were amazing on Sunday, too (ditto in Monday’s packed lunch). Wishing you comfort and richness as we close out the rest of this week, and I’ll be back over the weekend with the usual roundup! 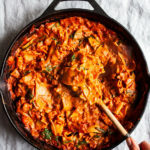 This looks absolutely delicious and I will definitely be making it once I discover what a skillet is (I’m not sure if we call them something else in the UK or they’ve just completely passed me by ), whether I have one, and what I can use instead if I don’t. Wish me luck! Gena, this looks amazing! It’s as if you’ve read my mind on this one. 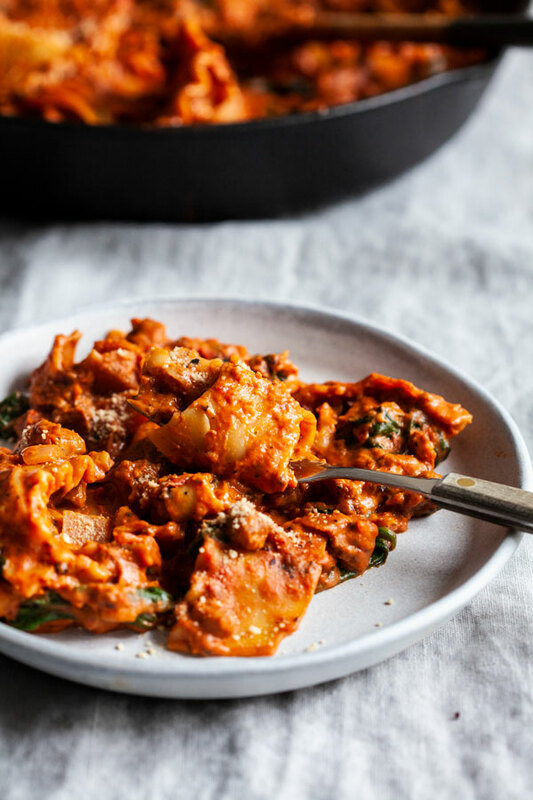 I’ve been craving lasagna lately, and can’t wait to make this! This looks so comforting and delicious! Reminds me of the kinda food I grew up on, lots of Italian American pasta specials! I alsways love versatility in a recipe, I think I would sub in white beans for the meat crumbles as I’m also not crazy about lentils either. And I have a box of gluten free lasagna noodles just waiting for this. Any thoughts on cook time adjustments for the gf noodles? If not, I’ll just wing it as usual. Sure! Just use the directions in the recipe note—should work for GF noodles as well as regular. I’m so happy you like the recipe! I made this the very same day I received the email with the recipe and it was perfection. We had several days of delicious leftovers too. I added in chopped zucchini, red pepper, and yellow squash at the same time as the noodles (instead of using veggie meat, which I will be trying next time for sure). So, so comforting and filling. Thank you! What a wonderful idea! My lasagna always seems to fall apart anyway haha, this way its on purpose. I am going to make this tonight with pumpkin pasta. This is delicious! I made it tonight, also using the Beyond meat crumbles, with a few modifications. I added half of a small zucchini (grated) and about a tablespoon of nutritional yeast instead of the parm. I will definitely be making it again! The only problem was the noodles were stuck together in a lot of places (my own fault for multi tasking with a toddler and not stirring it around enough). Next time I think I will do slightly less noodles and more veggies. Thanks for sharing this! The Lasagna recipe is beyond my expectation. I am going to try this today and will let you know how my children reacted. Thanks for sharing! Delicious! Thank you. I made it today, and my husband wants it for dinner this evening. Thanks again! Hooray! So glad you both enjoyed. I really loved this. I used frozen homemade tomato sauce from tomatoes in our garden. Thanks for the recipe! 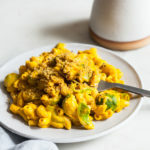 This recipe was delicious and exactly the kind of comfort food I was craving! Instead of the crumbles I used TVP, which I’ve been meaning to try out since my grocery store sells it in the bulk foods section (no wasteful packaging, yay) and it’s so cheap. I hydrated it with a vegetarian “beef” broth then cooked it in the pan with the shallots until a lot of moisture had evaporated and it started to brown. Other than that, followed the recipe just as written. So yummy, I will definitely be making it again. Thank you! Your comment is so well timed, as I’ve got a TVP chili planned for very soon. Delighted you liked it! I cooked this for dinner last night and it was so creamy and delicious. I followed the recipe for the most part, adding some crushed red pepper flakes along with the oregano for a little bit of spice. I opted for lentils for the protein, but honestly I think some vegan “beef” crumbles would be even better. I used no-boil lasagna noodles and I had a little bit of trouble with them sticking together. I think the solution would be to use an even larger pan next time. The one I used was about 12 inches but wasn’t super deep. Next time I make it, I will use a bigger pan and have some semolina bread on hand to mop up the sauce!